If you want your Kickstarter to be ridiculously successful, solve a problem absolutely every single smartphone user has: the need for more juice. 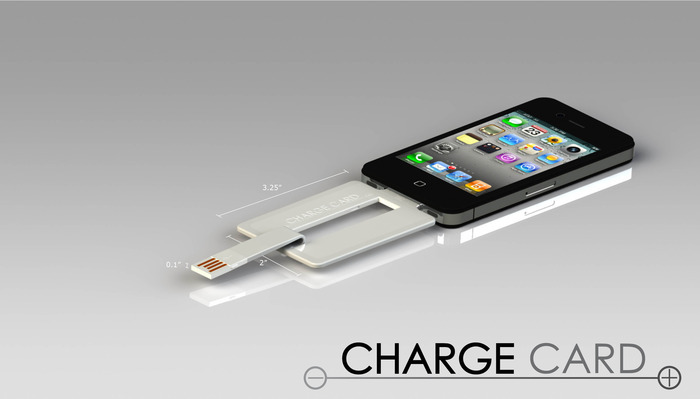 The Charge Card phone charger is slightly thicker than a credit card and is meant to fit in your wallet. It features a flexible USB dongle that plugs into your computer or outlet jack and the other end plugs into your phone, allowing you to charge without having to carry a pesky cable with you everywhere you go. Yes, it is currently only for iThings, but Android and Blackberry versions are coming soon. And frankly, although us Android users have to wait for our version to come out, let's face it: this is a Kickstarter, so even iThing users have to wait for theirs. The campaign has blown past their $50k goal and hit $90K with still a month to go. It will be interesting to see what kind of features or designs they add over the coming weeks to match the rabid demand. Simple. Brilliant. And a great design. Would you use it? I covet. Plain and simple.